If you want your spiritual message to get through, then the first thing to consider is the comfort of your congregants. If they shift from side to side in their church chairs or seem distracted during sermons or prayer services then it is time to reassess your current church seating arrangement. When selecting comfortable church chairs there are a number of factors that need to be taken into consideration. First, assess your space. Most houses of worship today need to be flexible, and the traditional bench-style pew doesn't offer that flexibility. Modern chapel chairs, with the ability to stack, link and unlink as needed, are the perfect alternative. It makes it so much easier to widen the aisle for a grand recessional. You'll be able to add a few more seats in that awkward space off to the left or remove a portion of seats to allow for handicapped seating if needed. Easily add to your church seating as your congregation grows. It's all customizable when you have invested in the right church chairs. Second, decide which kind of seating you need. Linked chapel chairs allow for closeness and a sense of togetherness while providing each congregant with their own personal space. And each congregant, especially your most senior church members, should feel comfortable sitting for extended periods of time. Ergonomic features, including built-in lumbar supports and waterfall fronts that reduce pressure on the legs, will ensure that they, and everyone else in the room, will be as comfortable when they leave the services as they were when they took their seats. Church chairs that don't link into pew-like formations are another option. These can be more economical. Single chairs are more likely to migrate during use, so factor that into your decision-making. Chairs that move a lot should have durable protective feet to preserve your floors. They can be a bit noisy as they are shifted around and will require re-alignment on a regular basis. Many of these are also stackable and can be easily moved to various locations via rolling dollies or chair trucks. Stacking chairs can serve as banquet seating if need be. They come with varying amounts of cushioning and are available with the waterfall front for comfort as well. Single chairs can also feature arms, which may be a consideration for the elderly in your membership. Next, consider the aesthetics. Seating color helps set the tone in your sanctuary. Luxurious colors add to the worship experience, each one evoking a feeling of its own. Deep reds and purples add warmth and passion; brilliant blues and greens provide a contemporary feel. Church chairs come in a myriad of colors and textures to set the mood exactly as you wish. Whatever color and mood you select, be sure to check that the fabric is colorfast, sturdy, stain-resistant and easy to clean when stains do occur. 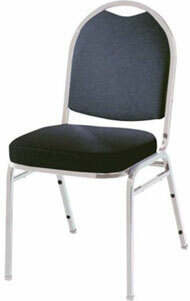 Make sure to choose chairs that will stand up to your congregation when they are sitting down! Luxurious padding, the thicker the better, is a wise choice as long as it meets the flammability codes in your state. The thick foam supports the body, extending comfort, and reduces the noise and distraction caused by fidgeting. The church chair padding should be set over a sturdy frame, one that will stand up to years of congregational use and abuse. Steel framing and well-engineered supports are the industry standard but come in varying strengths and price points. And chair framing can play a role in the "look" of your sanctuary as well. Light or dark, reflective and shiny or matte metal are choices you have to make. Deeper finishes can tie in with darker, more traditional sanctuary appointments, while brighter tones can emphasize the contemporary feel in more modern settings. Wood framing, though it may be much more expensive, is also an option, adding natural texture and coordinating with other wood-toned items in your worship space. Lastly, don't forget to consider these variables in church seating. Add-on pew ends provide an extra touch of tradition and formality. Book pockets and racks keep your religious texts stored respectfully, ensuring everyone can be on the same page while keeping your sanctuary neat. Of course, folding church chairs and stackables, with or without cushioning and arms, in metal or with hard plastic seats, are still available. These are quite economical, sacrificing comfort and aesthetics on the way to the bottom line. While they may be noisy for the sanctuary, they do have their uses. Easy to set up and then store away on wheeled carts or dollies, they're a great way to supplement your main seating for special events. If you are shopping by price, please beware of cheaper options, which may initially sound good, but do not provide value over the long run. Knock-down chairs are sold less expensively, but remember to consider the extra expense and effort you will have in putting a large quantity of them together, and keeping their screwed hardware tightly assembled over time. Next, think about special use or task seating. Classroom chairs with tablet arms for your older students. Tables and chairs for your preschool or nursery. Flexible seating for your Bible Study and Vacation Bible School students and activities. Special posture-enhancing chairs for your music room. Each use has the right chair out there. Think about who will be using it, and how. Are you having difficulty narrowing down your choices? Keep the faith! If you can't decide which option is right for you, give your favorite chair a try out. Many suppliers will send you a sample church chair. Give it a workout. Let people sit in it. Try it out for a few days. Is it comfortable? Does it look the way you expected in your sanctuary? Will it stand up to your students? Most church chairs today have been tested in the design phase and in houses of worship all over. But the most important test is the way it works in your space. So, do your research, make your choice and watch your congregation sit back and open themselves to your church's message.